Pakrantės g. 53, Bikuškio k., 28401 Utenos r.
“Alaušo Slėnis” is a Recreation Centre situated on the picturesque western coast of Alaušas Lake (~ 110 km from Vilnius, ~135 km from Kaunas). The centre is absolutely new and covers the territory of more than 4 ha; the maximum number of guests is 68. 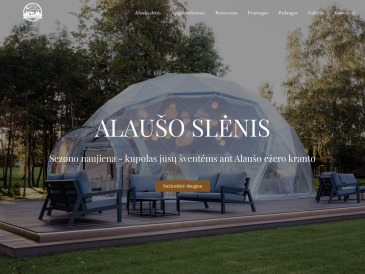 “Alaušo Slėnis” provides 4-star services of housing and entertainment. Our guests live in new rest houses with verandas looking at the lake, sitting-rooms, bed-rooms with modern furniture, mini kitchens and modern bathrooms. more about housingA wide range of free time activities and entertaining. Alaušas Lake not only relieves stress but is also full of fish, is perfect for diving and other water activities. Restaurant staff will cook the dishes of European cuisine from local products. The food in restaurant is healthy and of perfect quality. Breakfasts for guests are free. “Alaušo Slėnis” is a perfect place for organization of conferences and teaching seminars, business or personal events. Today you can reserve places not only for the summer season but also for the Christmas and New Year. “Alaušo Slėnis” provides its services during the whole year.